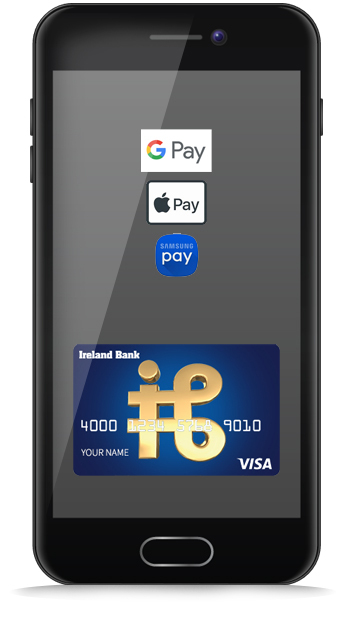 With just a swipe, click, or tap of your finger, use your Ireland Bank Debit Card to pay your way with your choice of digital wallet. Available on your smartphone, tablet, watch, or computer. Look for one of these logos to use your digital wallet at a store near you. Digital Wallet applications generate a unique digital card number for every transaction and your Ireland Bank Debit card number is never shared with a merchant. Getting started with your digital wallet is easy. Just pick your favorite application, add your card, then give us a call to verify your card and your good to go. Now that you are all set, you will enjoy the ease and security of a digital wallet with your Ireland Bank Debit card. If you are required to verify your card, please call Ireland Bank at 1-800-657-1020 Monday thru Friday 9:00 AM to 5:00 PM. To view the Terms for adding Your Ireland Bank Debit Card to a Third Party Digital Wallet please click here.